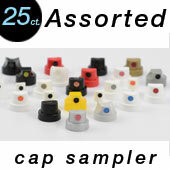 Shipping was super fast for a dvd and the 25 cap sampler. It arrived 1 day after being shiped and 2 days after ordering. a nice variety of caps but my only complaint is that i only got 24 caps instead of 25 for some reason. (apreply) Oh no! email us to see if we can help you.